Garden of Aaron: Hibiscus Time! The top photos show 'Luna Pink Swirl', a cultivar of our native Hibiscus moscheutos. 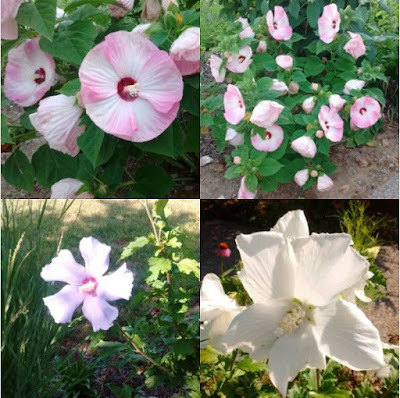 The bottom photos are two different cultivars of rose of Sharon (Hibiscus syriacus), 'Blue Bird' on the left (looks bluer in person) and 'Diana' on the right. Both species seem to be totally hardy in my garden - H. moscheutos behaves as an herbaceous perennial, while H. syriacus grows as a deciduous shrub.